Over the last few months I've been asked to post photos of my kitchen or do a 'tour'. So today, while doing my morning baking, I stepped back from the counters and snapped a few photos. Well, after thoroughly cleaning the ridiculous number of stainless surfaces. It is now quickly reverting back to its natural, fingerprint smudged state. 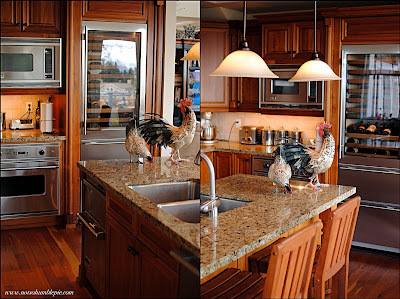 The kitchen lacks a lot of knickknacks--apart from the chickens--so it is a little low on the personality-scale. While polishing today and taking in the general look of the kitchen, I felt the impulse pull out all the pretty jars of legumes I keep in my pantry and arranging them artfully on the counters. I nipped that craziness in the bud. Staging a kitchen seems silly, even to me. Instead, I just got about my morning. A simple crumb cake for the family and a tart for today's blog post. At least I have a crumb cake in process. Perhaps not as pretty as some bell peppers but a whole lot more realistic. Okay, so I messed this dessert up a bit. Not the making of the dessert itself, but I did help myself to a slice before it had enough time to fully chill. I was not exactly rewarded for my impatience with good photographs. I have the rest of the tart chilling now, if the light holds out perhaps I can update the post with a few properly chilled slices. Regardless of the less than flattering photo, the tart is lovely. 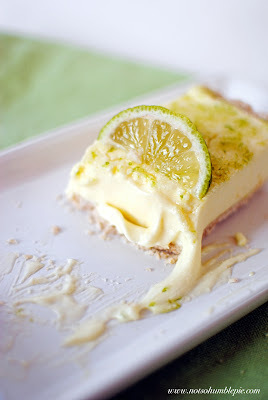 It reminds me of a sour cream lemon pie, only with lime and less acidity due to the use of cream. It also sits on a brown butter crust which lends the tart a very nice nutty fragrance. I wanted a piece. Immediately. Start with the curd, as it will need time to chill after cooking. Place the butter into a skillet and melt over medium/medium-low heat. Allow it to cook without stirring until the butter is golden brown and has a warm, nutty fragrance. Meanwhile, combine the salt, sugar and flour in a small mixing bowl. When the butter is ready, pour it into the bowl in a steady stream while stirring with a fork. Mix well and then pour the crumbs into your tart pan. Press the crumbs into the pan to form the crust. Stab the crust liberally with a fork and bake for 20 minutes until light golden brown. Pull out of the oven and allow to cool on a wire rack completely. When both the crust and the curd are cool you can fill the tart. Beat the 3/4 cup of heavy cream to stiff peaks and then add the lime curd. Beat in the curd until just incorporated and then pour into your crust. Smooth with an offset spatula. Lightly cover the tart and chill for 4 hours. Make the topping by blending the sugar and lime zest into a fine powder in your food processor or blender. Just before serving, sprinkle the tart with the lime sugar. Your kitchen is beautiful! No wonder you are so inspired to cook. My kitchen, well, it inspires me to eat out. I'm also glad that you have started to use "normal" measurements, such as cups and teaspoons. It makes the recipes slightly less intimidating. Oh goodness your kitchen is so beautiful. And I absolutely love lemon curd, so I can hardly wait to make lime curd. Trust me, I ruin a lot of potential pictures by digging into my desserts too early! If I'm baking from a cookbook I own and it uses volume, then I'll post those measurements. Occasionally, I'll also weigh out each item, for everyone outside the U.S. who dislikes our peculiar system of measurements. However, if the recipe is in weight to begin with (like many of my cake and bread recipes), then I just post the weights. Those are nearly impossible to convert to volume without a massive headache. It starts looking like: "3/4 cup plus 1 tablespoon and 1/8 teaspoon of sugar." Hopefully, I have enough of both types of recipe to keep everyone happy. I am limp with envy. My current kitchen is good as rental houses go, but it will be a few years before I can afford to buy a house, and a few years after that before I'll be able to renovate the kitchen to my standards. Your kitchen is as beautiful as the desserts that come out of it. I want that tart. Don't be too envious. I'm a renter too. The house is owned by Mother Humble and her husband (Step Humble?) and I am quite grateful that they allow Mr. Humble and I to occupy it. Mere microbiologists don't own houses this nice in Seattle. @ Mother Humble (since I know you'll read this) yes, that was me being appreciative. Oh, and I bought you something awesome at Sur La Table last week. I'll show you when you are in town on Friday. That is one lovely kitchen!!!! It looks like a room that one wouldn't want to leave. I think the "normal" measurement post was referring to missing measurements in the curd portion of the recipe (1/2 granulated sugar and 1/2 lime juice). Other than that, this sounds divine! I might have to have birthday tart instead of cake! Oops. Edited for the 'cups'. That looks fantastic--I have been seriously talking about lime tarts for two weeks now! It's like you're always one step ahead of me, and I LOVE it, because then I read your posts and go, "Oh, OK, that makes sense/looks good/seems doable." Do you have a particular tool you like for zesting? I have two options (a little zester with about three holes and a regular cheese grater with a small side), and I'm not very good with either of them. Also: your kitchen makes my apartment kitchen weep. I bet your oven even goes below 250. For the longest time I used an ancient parmesan grater to zest. However, that mysteriously disappeared during one of Mother Humble's recent visits (cough) and I was forced to buy a replacement. I bought a Microplane zester and I really, really like it. It produces a feather light zest with almost no bitter pith. c. i am SO looking forward to baking this tart for an upcoming bridal shower...can i freeze or will the crust & curd texture be compromised? What I would not do for your kitchen! Farmhouse kitchens with no light and a dodgy cooker do not = good food sometimes :) Excellent looking recipe, must must try! I wouldn't freeze the finished tart. You can however freeze the unbaked crust and the curd will keep for a several weeks refrigerated in an air tight container. When you need it, you can bake the crust, whip the cream and add the curd and then assemble. It is also important not to add the topping until right before you're ready to cut and serve. 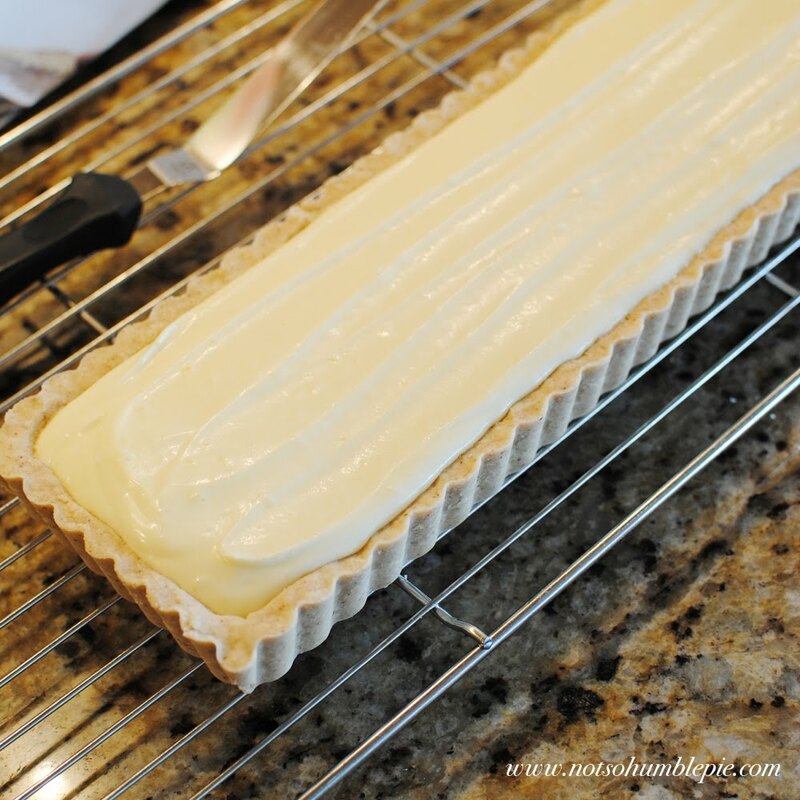 The sugars will eventually melt on top of the curd and create little cracks in the tart. I used to live and cook in an old farmhouse that housed three generations of my family. It had two wood fired stoves (one in the kitchen for cooking and one in the dinning room), a sink, an old electric stove and fridge, and nothing else. No dish washer. No disposal. No luxuries. Not even insulation, so occasionally things would freeze in the winter. Fun! It had a lot of charm though. I really liked that house. taking your advice & will prep/freeze crust & prepare the curd prior! also much thanks for the topping tips as well!!! have a nice w/e...hope we all have good weather. oh...will you post mother h's sur la table gift...curious!! Can't mention what it is here, since it would ruin the surprise. After all, she reads everything I write here... I think. She arrives next Friday and will be here for nearly a week(? ), so maybe I can convince her to do a little baking with it. Though her usual routine when in Seattle is getting up at 1AM, pillaging my pantry, cooking enough food to feed an army (25lb fish pie anyone?) and then napping all day. I know it is not right to covet, but how can one not do so after looking at your lovely kitchen?! And that stove! Oh! I'm so jealous!! You are truly blessed. I love that the chickens have French words written on them. First, I love your kitchen. Second, your tart is absolutely gorgeous!! beautiful kitchen and equally beautiful tart. I think slicing it before it chills makes it looks even more appealing. Your kitchen is stunning! I had a kitchen-gasm! 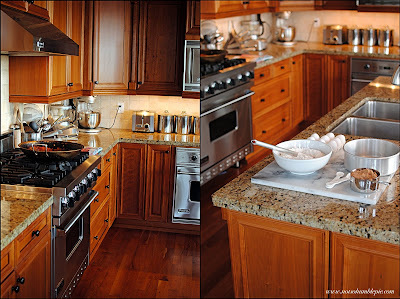 I covet your counter space! I grew up in a house with a 14"square piece of counter for baking, and now I have..... just a little bit more in a tiny apartment kitchen. I swear, if it wasn't for the wall of windows, my claustrophobia wouldn't even let me in there! That tart looks divine, and I must say that I am very envious of that beautiful kitchen! Beautiful kitchen! Thanks for sharing... and my husband is never opposed to my suggestion of lime desserts... now I just have a new excuse for one! ie "Look honey at that beautiful tart! I think I may have to make one this weekend..."
I am not usually a fan of limes, but our neighbour gave us a bagful of them from their lime tree. 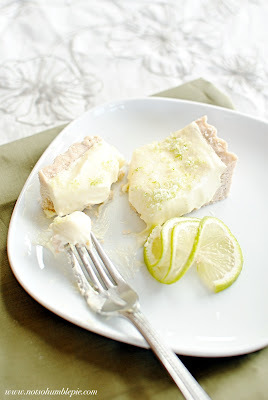 I've been searching for a good lime recipe and I think this might be the one! Your kitchen is beautiful and your mascots are amazing. What's the best way to store left over egg whites? Love the tart, too. And the photos. Have got to do some serious work improving my photos. So I made the lime curd for this tart ( you seem to know just when I need to get rid of some sort of cirtus in my house) and was all set to make the crust...when my mom walks in, holding a coconut cream pie from the local baker. :O So you know what I did? I whipped together some whipped cream, folded that curd in, and slathered it on top of the pie. The result? Tropical goodness. :) That lime curd was insanely good! your kitchen is beautiful!! (sorry to be an echo) I love reading your blog, but have never felt adventurous enough to go out and get the ingredients to make something :) always making my mouth water though! I was about to be bitterly envious of your kitchen until I read your comment about renting and felt better. We just bought a house last July and while our kitchen is extremely nice comparatively speaking (formica counters and an overly easily chipped kitchen sink and all) it's not luxurious. I picked up one of the original microplane zester graters about 5-6 years ago, and it was a terrific investment, but it has a handle. How do you use that one without a handle? I've been considering upgrading, since mine is extremely difficult to clean due to its almost triangular shape. Miss Humble, will you please share where you got your chickens? I adore them! Yes, how did you make them?! The grater has rather high sides that allow you to hold it and somehow the teeth don't irritate your hand much. It could be more comfortable to use, but I suppose it makes up for that in being easy to store in a drawer. 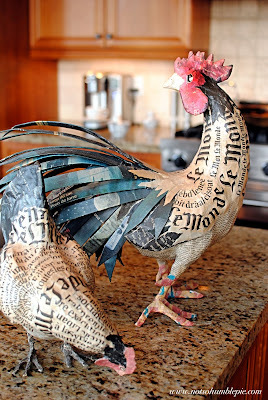 I didn't make the chickens (I wish!). They are made by two artists, Nicole Jacobs and Aude Goalec (sisters I think). They were found in a little shop on Rue du Bac in Paris. What do you use to keep your stainless steel appliances looking wonderful and fingerprint/smudge/streak free? I had a huge party over the weekend, so I'm just now recovering and reading your weekend posts. I'm so excited about a Sur La Table gift! But you know all that I really want from you is your love and affection. Also maybe some gratitude for raising you, feeding you and generally keeping you alive. And maybe some thanks for my giving birth to you (extremely painful I might remind you...). Also occasional admiration for my intellect, and the strong moral example that I set for you and your siblings. And maybe a promise that you won't eventually put me in a home. Your tart looks amazing... eventually I will set out to accomplish one of your recipes but that may have to wait until I get an oven that stays at the temperature of your desire not randomly spiking to 500 degrees. i can across this recipe last week and have thought of it ever since! i'm running to the store for some limes and making it! can't wait to take a bite! Plenty of practice and I take it slow. Also, I often use a small flat-bottomed, straight-sided ramekin to help press the crumbs against the sides and bottom of tart pans. Your kitchen is lovely! I have Pintrest to thank for leading me to your beautiful blog!